When replacing your above ground swimming pool liner, it’s important to know a few details about your pool prior to making your liner selection. Knowing these few things before ordering can save valuable time and money. Please take a moment to read the information below to familiarize yourself with the different types of pool liners available. This will ensure you get the correct liner for your project. Measure Your Pool First – I know this is redundant but it’s important. Don’t be that guy who orders the wrong size pool liner. Measuring a pool only takes a minute of your time but can save you money, time and headaches. You cannot substitute something close in size so it needs to be right. How To Measure Your Pool – To measure round pools simply measure straight across the middle to the opposite side. It is good practice to measure across from two different directions just to be sure. On oval shaped pools, measure at the longest points in length and width. You should also measure the wall height. To do this simply measure one of the upright posts from top to bottom. Wall height measurements are needed for many of today’s above ground pool liners. Do not measure pool wall height from inside of the pool. This number can be inaccurate due to pool cove or the floor of the pool being raised up from addition of sand etc used to create a flat and smooth finish. The pool wall height measurement is important because beaded, j-hook and unibead pool liner are made for a specific wall height only and substitutions can cause excessive wrinkles and stretching. And if your pool has a deep end or deep middle you should know the total water depth as not all liners are capable of stretching to fit. Overlap Pool Liners – are easy to identify as they simply go up the inside of the pool wall and hang over on the outside, leaving several inches of excess vinyl visible. These liners are held in place with strips of plastic called liner coping strips. Overlap liners are the most affordable pool liner and can come plain or decorative and in various thicknesses. Overlap liners are made to fit 48″ 52″ or 54″ pool walls. Click to view overlap pool liners. Unibead Pool Liners – work in most any above ground pool and are very easy to install. Unibeads attach by simply hooking onto the top of the pool wall. If using a bead track, tear off the removable hook and snap liner into the track or receiver. This stylish upgraded liner needs no additional parts for it’s use. Great waterline graphics, 20ga or thicker 25ga vinyl, 48″, 52″ and 54″ wall heights available. This style of liner requires pool wall height when ordering. Click to view unibead pool liners. Expandable Pool Liners – are simply very tall overlap liners. Extra big to ensure adequate material exists to accommodate deeper swimming areas. Expandable liners allow for 2-3 feet of additional water depth, making typical above ground pools up to 6 or 7 feet deep. Deep ends and deep centers are created by dishing out the pool floor to the desired shape and depth prior to installing the expandable liner. These liners conform to your unique pool floor shape. Trim off excess material if needed. It’s important to note that not all expandable liners are the same. Some will accommodate up to 2 feet of additional water depth while other liners can go an additional 3 feet. Click to view expandable pool liners. Beaded Pool Liners – these liners attach to an above ground pool using a track system. Beaded liners simply snap down into the bead track or bead receiver along the top of the pool wall. Beaded liners are often sold as unibead liner because the Unibead liner is capable of doing the same thing so there is no need to stock both style liners any longer. When a unibead liner is used in with a bead track you simply tear off the removable flap at the top and snap the liner down into the track or receiver along the top of the pool wall. This style of liner requires pool wall height when ordering. When it comes to installing an above ground pool liner, the process for new and used pools or liner installations is the same. You must make the pool floor smooth and nice to walk on first. This varies big time from location to location. In South and Central Florida the soil is usually soft and easy to manage with rakes and other ground tools. But in North Florida the ground can be much harder and often include large rocks which will to be removed. Regardless of where your pool is going the idea is the same. Make the ground as flat, free of debris and smooth as possible before installing the pool liner. Most of the jobs I’ve been on did not require sand to get the pool floor smooth. The natural earth in Central Florida is ideal. If your location is less than ideal simply add sand or dirt and smooth out flat. Use only enough sand to make the bottom smooth. This is often only 2″-3″, adding more than required will be a bad thing. When too much sand is applied the pool floor becomes full of footprints and lumpy. You will not like the final results, trust me here. One common question is “Will pool floor pads take the place of sand?” The short answer is no. Pool floor pads are considered liner protection from sharp objects and do little to make a rough and lumpy pool floor smooth as glass. I highly recommend Armor Shield for all above ground pool floors in Florida. They stop moles, beetles and other insect that burrow and puncture vinyl pool liners. Armor Shield also protects from broken glass roots, rocks and other bits and pieces that often get overlooked during the installation process. Use Armor Shield or nothing at all, regardless of what you read or others tell you. Foam, plastic sheeting, roofing paper etc all do nothing to help your cause and all promote early rust out of the pool wall. We have included a basic pool liner installation guide from Swimline’s website. It’s not bad and is fairly straight forward. To view the overlap and beaded pool liner installation guide click here. 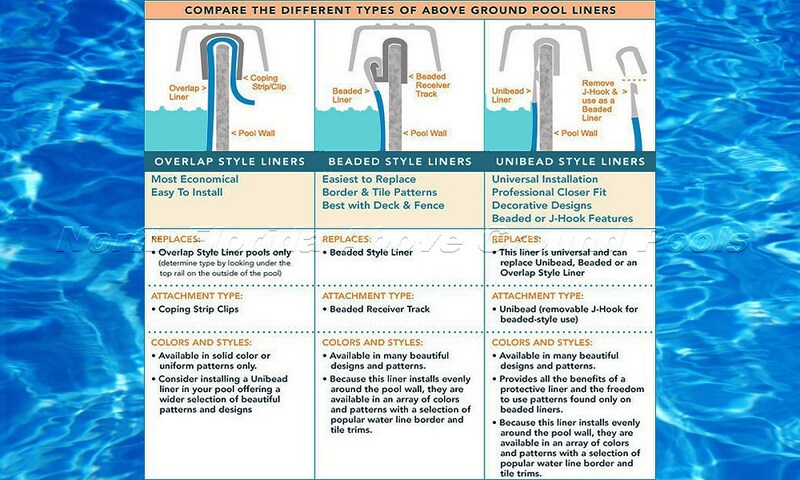 For unibead pool liner installation instruction click here. Every pool liner purchased these days come with a warranty provided and backed by the manufacturer. What these warranties are and how to make a claim is included within the liner box itself. These warranties may vary by actual brand but are all similar in structure. This means they are pro-rated much like a car tire or battery. If you were to have an issue with the tire immediately, the maker would replace it free of charge. And if you drove on it for 2 years and 20,000 first, they would likely require you to pay a percentage of the replacement cost. This is fair and common for many products on the market. Pool liner manufacturers tend to be pretty fair in honoring their warranties and only require proof of the damage and proof of purchase. Proof of the damage can come by pictures of the problem area sent by email or the actual defect sent to the maker by mail. This is their call not yours so you must comply if you want relief. The second requirement is proof of purchase. This is needed to determine the age of the pool liner and ultimately the percentage you must pay toward replacement if covered under warranty. The largest pool liner manufacturer is Swimline Corporation in New York and there liners are what you typically see in most pool stores, both online and brick and mortar stores across the country. They are sold mostly using the 20ga. and 25ga. distinctions mentioned before. Their 20ga. liners come with a 15 year warranty and the 25ga. liners come with a 25 year warranty. Click the links below to view Swimline’s pool liners warranties.